Earlier this week, progressive UK electronic act Underworld took a trip to Abbey Road to rework their 1994 single "Cowgirl" — which was recorded, pressed and ready to play within just 12 hours. The duo recorded the track in front of a live audience on Monday evening (November 24) before sending off the masters to the Vinyl Factory at 1 a.m. Tuesday morning. The first copies were pressed on white wax and ready to go by 6:15 a.m., meaning the turnaround clocked in at less than 12 hours. Fellow vinyl enthusiast Jack White shattered a world record earlier this year, recording and pressing his "Lazaretto" single in just four hours for a special Record Store Day release. But Underworld can still take pride in their feat, setting the bar for the quickest vinyl pressing in the UK, as well as nabbing the title for quickest pressing on coloured vinyl. The singles were distributed to lucky audience members, and the event was the inaugural session of the Black Label Project, which will be offering up collaborations between established and up-and-coming UK electronic musicians. 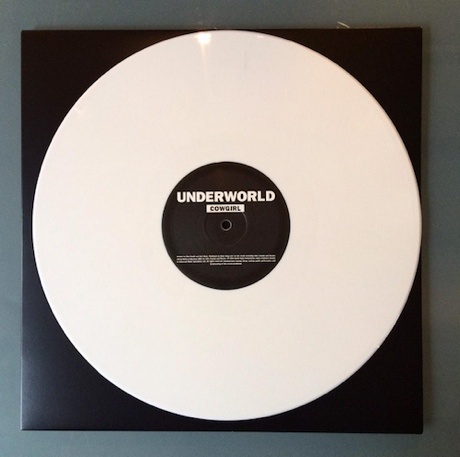 Reflecting on the accomplishment, Underworld told the Vinyl Factory: "The opportunity to make a recording live to vinyl is a unique one and it was exciting do it in front of an audience in the hallowed halls of Studio 1."